Hey everyone! I hope you’re all having a great weekend! 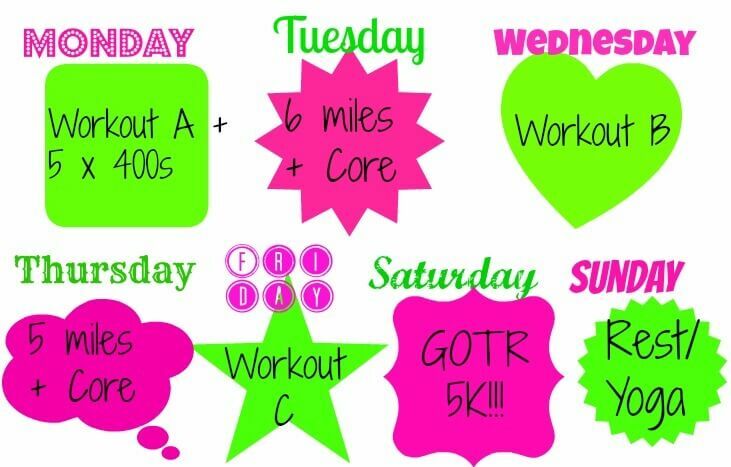 This upcoming week I start my half marathon training (if my IT band cooperates…) and I’m continuing with Week 3 of Tina’s Best Body Bootcamp. That’s a lot of workouts to take in, especially with my very busy schedule! Sunday – Thriller in Schiller 5K! A BLAST! Monday – Workout A plus intervals (did the intervals on the elliptical). Today I worked out in the evening, after GOTR practice, and I was NOT a fan! The gym was packed and there was a class in the room I normally use. Tuesday – Attempted to run (goal was 6 miles), but I only made it 2.5 miles before I had to stop. I tried to switch to the elliptical but that was still aggravating my IT band so I stretched, rolled and called it a day. Thursday – 50 minutes of cardio, broken up on 2 different elliptical machines, plus planks. The key when trying to combine two different workout programs is making it work for you, and adjusting where need-be. I actually forgot the Girls On The Run 5K was this Saturday until I put together my schedule! I had to re-arrange some of my miles (the 6 miles is a combo of two 3-milers) but it seems to all work out! I can’t wait for the 5K with the girls! The race is open to the public, so if you live in Chicago you can register here! It’s in Toyota Park, so easy to get to and there’s parking! What do you have coming up this week? If you’ve run a 5K, what was your favorite one? Why?